"FACT: If you poke me, I giggle. Just don't poke-poke me. Then I would get Pissed Off and get Mideval on your Arse!" Usually I have a Large leather Pro Bag with assorted tools of the trade. 1. Hedge trimmer -- You never know when that pesky underlying branch can get in the way of your swing. 2. Branch saw -- I don't want to break my clubs on my forward swing. 3. Shovel -- Those Sand Traps are dangerous. 4. Two very long poles -- Great for running your ball along; gives straight and true path to the hole. 5. Laser Guided Do-Hickey Yardage Measure Device Thingy -- Hey I want to know how far I could have hit the ball. If I could actually hit the ball. 7. LoJack Golf Ball Tracker -- Enough said. 8. Pool Cue -- For the short puts. 9. Five Finger Pool Cue -- For the Long puts. 10. USGA Rule Book -- with personal amendments. 11. Cooler of booze -- I am older than 21 officer. My ID says so. Acting my age though is optional. 12. Backup Cooler of Booze -- in case my original cooler runs out. Titleist Sunday Bag. It's tiny! But still HEAVY! When walking -- My Red/White Sun Mountain Bag Trolley Do-hickey thingy with a very BIG Red/White Umbrella for very sunny days. AKA "The Hotdog Vendor mobile"
Sleeve of Titlist Tour Distance Balls with so many dots on it the ball looks like it has measles. And when possible I always make sure I have on one of these great tees. Congrats Rory McIlroy British Open Champion! Once a part of the GK staff it WAS my job to keep the peace. If you have questions about our Terms of Service, Community Guidelines or Frequently Asked Questions please consult these links here. Well wouldn't you know it all my friends don't play golf. Just trying to get a regular four/fivesome going on a semi regular basis. If you want to play just send me an email here on GK. As your resident forum guru I am here to facilitate and generate conversation. If I ruffle a few feathers it's not my aim. So if the ribbing gets too intense for you, relax and take it all light-heartedly. I do. And so should you. 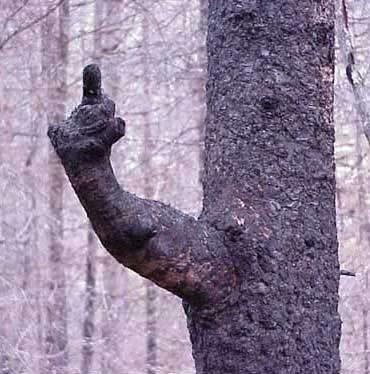 And you ever wonder what the trees would say along a golf course? Well here is one giving back to the man that hit him last with a golf ball. For those of you who love the Force as much as they love golf :D This is also my Wife's personal favorite! Go Mobile with GK on Twitter! Presently updating Scorecards......and How to use the Handicap Tracker to improve your game. The new GK Newsletter.... is a Great Advertising Opportunity! Welcome 2008! Another year in golf! In Anticipation of BigDog's event tomorrow. Ringworld and his take on this new blog.